It seems to me that a good many sophisticated people, including a lot of lawyers, don’t fully understand the role of storyboards in developing an animation. A storyboard has been defined as a graphic organizer in the form of illustrations or images displayed in sequence for the purpose of pre-visualizing a motion picture, animation, motion graphic or interactive media sequence. The first story boards were used by the Walt Disney animation team in the early 1930s, and at A2L, we use storyboards in exactly the same way – to pre-visualize an animation that we are intending to use at a trial. As longtime readers of this blog may know, I came to this business about 25 years ago, just after my law school graduation. I knew a good deal about computer animation in the Toy Story era, and I originally envisioned A2L as a trial animation company for attorneys, focusing in the intellectual property area. A2L has grown to become a leading trial consulting firm and a top provider of litigation graphics and jury research, but I’ve always had a special fondness for litigation animation. Animation remains a very vibrant part of trial practice, especially now that common tools like PowerPoint provide a basic animation function as a standard offering. It’s no longer necessary to bring in a specialized designer to provide animation for trial. We’ve written about this in articles like Legal Animation: Learn About the Four Types Used in the Courtroom, What Does Litigation Animation Cost? (Includes Animation Examples), and Patent Comes Alive! Turning Patent Drawings into Trial Presentations. The process for a 3-D animation or even for one in PowerPoint hasn’t changed much over the last several years, although many people are not as familiar with the process as they should be. There are four main steps: storyboarding, designing/modeling, animating, and rendering. The first step, storyboarding, is perhaps the least understood by attorneys and clients. 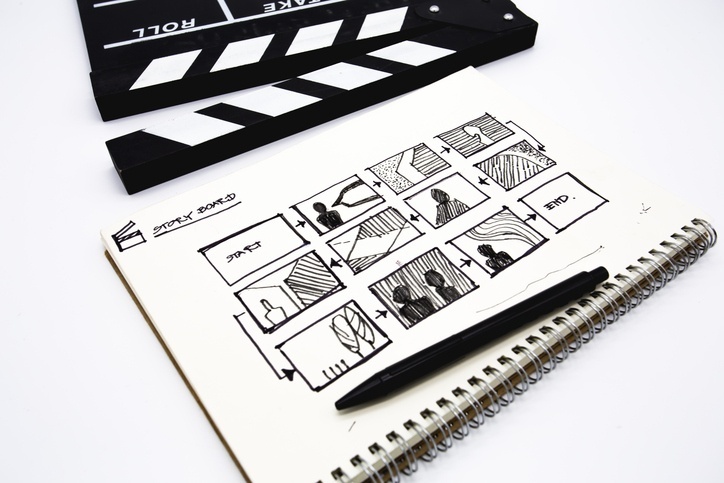 Whether one is designing a major motion picture or a three-minute trial animation, storyboarding involves creating sketches or illustrations to rough out the final product. In the case of litigation animation, the storyboards are intended to give the lawyers a sense of how the story will unfold. In a storyboard, an image is paired with text or a voice-over that describes a scene or a concept. As you can see from the example of these storyboards here, and the accompanying animation based on them, a storyboard can show how an image might rotate, zoom in or out, or change in other ways to demonstrate a relevant point. 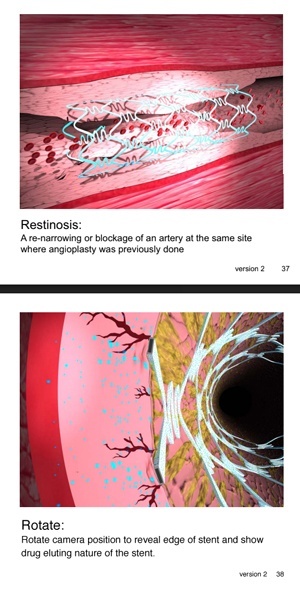 These storyboards from a patent case show how restenosis (the formation of new blockages at the site of an angioplasty or stent placement) can form in blood vessels when a non-drug-eluting stent (one that does not contain an anti-stenosis drug) is used by a heart surgeon. After seeing this presentation, the jurors understood how stents work and why such drugs are used. This animation helped lead to a verdict for our client of $450 million. We use storyboards to save time and money for the client, since they can be developed quite rapidly, as opposed to the time needed to build a full courtroom animation. Storyboards give A2L’s specialists and our clients the ability to visualize how a story will be told before the animation is actually created. I have found that the storyboarding process, unless it’s explained well in advance, can be confusing for some trial teams. It can be difficult to envision what the final product will be after seeing only a sketch, and there’s some fear that the final product will look more like a sketch than a fully developed animation. But decades of experience have shown us that the storyboarding process is an indispensable step toward success.